"Patience, Pause And The Powell Put": This Is The "Big Trade Now"
It took Fed Chair Powell less than three weeks to complete the trip from his hawkish posture unveiled during the December FOMC press conference in which he said he was not worried about a "little market volatility" which in turn shocked traders and sent stocks tumbling, to what Albert Edwards dubbed "abject capitulation" in last Friday's Powell speech alongside Bernanke and Yellen, where Powell urged "patience" and hinted that a rate hike "pause" may be appropriate depending on the market, a posture reaffirmed by the latest FOMC minutes which were dramatically more dovish than Powell's December press conference. The result: "patience, a pause, and the Powell Put" came into focus far more quickly than many anticipated according to BMO's Ian Lyngen, who notes that the Fed's capitulation now shifts the discussion to whether or not the Fed can "deliver a repeat of the 2016 do-over" (i.e. cease hiking for an indeterminate period of time, but ultimately restart the tightening campaign). Lyngen writes that while he is sympathetic to the notion that given Yellen was able to orchestrate a temporary pause it should be assumed Powell can as well, however there is a significant caveat: while the Fed was on hold throughout most of 2016, 10-year yields rallied to the record low of 1.32%. Said differently, regardless of the ultimate outcome, "the trade now is to fully price in the end of the current cycle and the beginning of the next" according to the rates strategist. What does this mean in terms of timing? At the risk of stating the obvious, Lyngen writes that "the Fed’s tone change in favor of ‘pause friendly’ rhetoric is referencing the March and/or June meetings" - after all, a 25bps increase every quarter was used to define "gradual" in 2018. Moreover, despite the Fed's claims that "every meeting is live", a January hike was never really on the table. That said, there is the distinct possibility Powell "mixes it up" with a May move, although Lyngen suggests that a six week hiking hiatus is very brief to assess the extent of the economic cooling created by last year’s tightening and balance sheet runoff. A May raise better fits the narrative of redefining ‘gradual’ as semiannually rather than quarterly. In other words, following the recent blockbuster jobs data, it’s still too early in the year (as well as the policy communications process) to conclude that anything other than a March hike is in jeopardy. First, policy rates are much closer to neutral; in fact, with CPI expected to print at 1.9% on Friday and effective Fed funds at 2.40%, real funds are 50 bp; arguably neutralish. Further to the point, determining neutral was always going to be a ‘know it when it arrives’ exercise. Second, the shrinking of the Fed’s balance sheet introduces another unknown which wasn’t in place in ‘16 following the liftoff hike. The SOMA runoff, as well as the passage of time (i.e. money growth), has already brought excess reserves incrementally closer to a new normal – a moving target to be sure. The third defining difference is that rest of the world is no longer in a collective easing mode. The ECB has run out of bonds to buy, the BoC delivered five 25 bp hikes, and the BoJ demonstrated a greater tolerance around to zero target for 10-year JGB yields – although at just 2.4 bp presently, this a moot point. Fourth, the housing market responded to higher rates in the anticipated fashion by slowing – undermining a key driver of the wealth effect. Fifth, expectations for demand driven core inflation to finally return have been significantly curtailed as the FOMC has tightened policy in the absence of such pricing pressures. Sixth, the economic weakness seen overseas appears to be more broad-based as Germany flirts with a recession and the rest of Europe struggles. Overnight, we saw French Industrial Production decline -2.1% YoY for the lowest mark since Nov 2014, to say nothing of the uncertainty linked to Tuesday’s Brexit vote. A slowing China is also assumed, but matches 2016. Seventh, and last, in 2016 while no one knew what ‘normal’ monetary policy would look like this cycle, it was universally accepted that wasn’t the prevailing 0.36% policy rate and a bloated balance sheet. Three years later, with steadily declining excess reserves, 2.40% effective Fed funds an extremely tight labor market, lowflation, and tightening financial conditions, the situation is much closer to a semblance of normality. With these caveats in mind, where does that put us in terms of trading the end of the current hiking cycle, and the start of the next cycle - whether tightening or easing - at least as seen by the rates market? As the groundwork continues to be set in place for the Fed’s eventual pause, Lyngen writes that the price action from Wednesday's session made fundamental sense as Fedspeak and the Minutes both emphasized patience while the path forward becomes less clear cut. And while a breather from the quarterly cadence has not been explicitly laid out just yet, the market seems to expect one may be approaching as Treasuries rallied and the curve steepened to end the day. Today we get even more key insight into the mindset of the Committee in the form of remarks from Powell, Clarida, Bullard, Evans, Barkin and Kashkari as well as a gauge on investor appetite for duration with a $16 bn 30-year bond reopening. So while BMO believes it may be premature to call the local yield highs set for now - and perhaps the low for stocks as new easing gets priced in, especially since as we noted in an earlier post, each of the last three recessions start with a rate cut, to Lyngen it certainly appears that the consolidative selloff we’ve experienced recently may be running out of steam. And not just Lyngen: as SocGen's Albert Edwards wrote earlier, "the market has decided the Fed tightening cycle is over, and historically the market has been pretty accurate in its predictions." 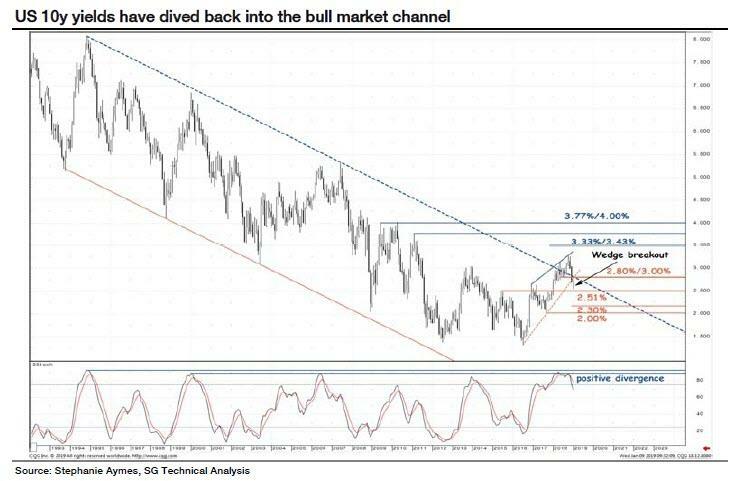 Which is also why Edwards, like Lyngen, believes that the lows for Treasury prices has been hit and that fears about further selling could be put on hold "when the US 10y bond yield recently broke above the upper bound of the downward channel." Back to Lyngen, he notes that since momentum is no longer overbought, the way is cleared for a rally, and points out that "first resistance will be 2.639% which is a prior weekly range top before 10s would eventually challenge the local low at 2.541% set at the end of last week." What does all this mean for stocks? Well, recall what happened for much of the past decade when markets were convinced that any economic deterioration would merely boost the Fed's resolve to intervene more forecefully. In other words, "bad news is good news... and good news is also good news." Trade accordingly, at least until the S&P rises another several hundred points at which time we expect the Fed - which has now made it painfully clear it only cares about the S&P 500 - to pull back and turn hawkish again and the cycle to repeat.